This often overlooked classic takes you on a Hawaiian roller coaster ride with added aliens and emotions. 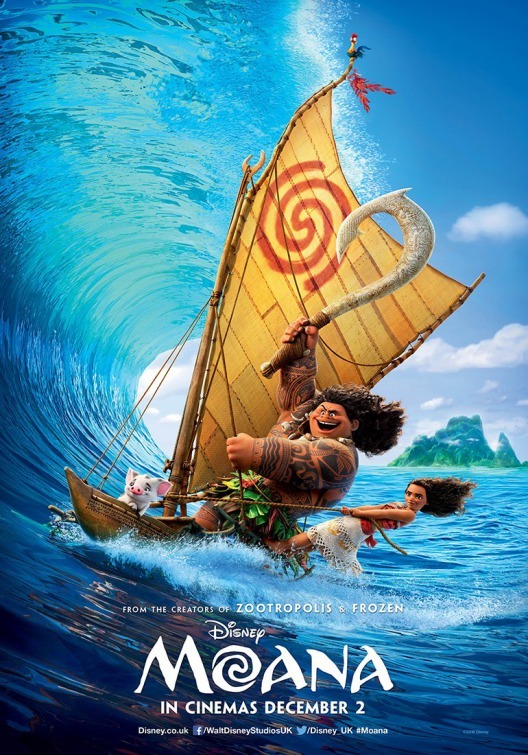 Not based on anyone one tale in particular, which is unusual for a Disney princess, Moana’s story is a simple one: the daughter of a Polynesian chief (Auli’i Cravalho) sets off on a quest to find the demigod Maui (Dwayne Johnson) so he can help reunite Te Fiti with her heart, thus saving her island and possibly the entire world. It’s a basic Point-A-to-Point-B adventure film, but with so much life, energy and emotion. It’s perfectly cast, and the animation – particularly the parts with the ocean in them, which is almost all of it – is jaw dropping. But what brings it all together is the cast of characters. Moana doesn’t fit into the ‘there are no girls like me’ trope, and she’s a better character for it. She could be anyone. She’s brave, kind, adventurous and resourceful, and there are millions of girls just like her. She’s also unsure of her path and sometimes needs a push, but there are millions of girls like that too. Though he fits the specifications for a comedy sidekick, Maui doesn’t feel one. Instead, he’s half of the duo that makes up Moana and Maui, wayfinder extraordinaires and heroes of all. However, as this is a Disney film, there’s still a comedy sidekick in the form of an idiot chicken, somehow voiced by Alan Tudyk. The chicken gags are mostly physical and childish but they’re still funny. Original songs by Lin-Manuel Miranda, Opetaia Foa’i and Mark Mancina continue to add to the magic, with special mention going to ‘Shiny’, sang by a giant glittery crab voiced by Jemaine Clement. The entire sequence is mesmerising and bizarre with a kind of David Bowie/Flight Of The Conchords mashup soundtrack, but the best version of that combination you can imagine. Like so many 21st century Disney films to get cast aside, Moana is an aquatic slap in the face to the people that stop listening when you try to talk to them about anything made after The Lion King. Those people can’t really be called Disney fans. They’re just snobs who probably think all millennials are crybabies and that leggings should never be worn as trousers.